Thanks Easts... geesh so close to a perfecto! Round 9 Tipping Skinny: Flip a coin on Thursday and Friday nights... got a hunch Moylan is the difference in Bathurst, Roosters get the cavalry back, Cowboys over a depleted Manly, Dragons because they didn't lose by 40 odd points last week, Storm over Titans but not confident here and Broncos over Sharks if Glenn plays... they'll miss McCullough but not desperately and are an outstanding side - the Sharks still just want to be one. Should've gone the Sharks... missed on Takairangi's knock on and the Dragons finding a way to score points on the Gold Coast. 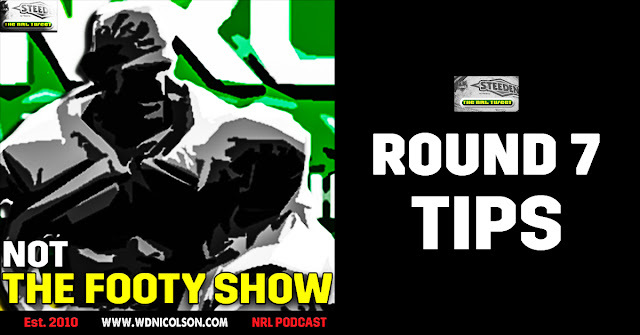 Round 8 Tipping Skinny: Souths will stand up one week soon but you have to take Brisbane; Dogs at home please; Raiders... well maybe if a new team turns up against the Tigers at home; Cowboys to get revenge over the Eels at home; Sharks at home; Manly only because the Knights are even more suspect; Roosters over Dragons... no real good reason why but Saints aren't a great team either; and Storm over Warriors because we're in Melbourne. Missed on Souths, Warriors and Storm... acceptable mistakes really. 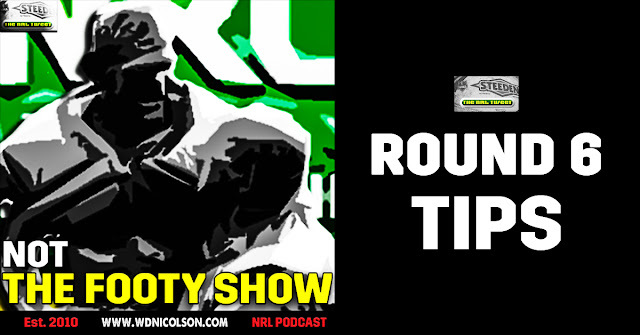 Round 6 Tipping Skinny: Manly, Warriors and Raiders are bold picks, Titans, Storm and Panthers are slightly less so - but Broncos and Cowboys should both win (though Souths with Reynolds back might know how to attack again). If you are tipping completely safe at this stage - can't fault you - just go with the favourites. Missed on the Chooks... and got lucky with the Panthers. Aced the Raiders. Round 6 Tipping Skinny: Broncos should win if they reach double figures, my faith in the Chooks has gone... until they win a game, Parra over Canberra on home ground factor (just), Cowboys will get pushed by the Panthers, Sharks but not confidently (I like the Titans this year - real goers with ability = good combo), Warriors and Storm are rolls of the dice but the Knights-Tigers game could be the toughest of the round to pick.